'Switch' is finally back and after some medical issues, Stjepan Sejic has returned to form with his teen Witchblade series. Issue three picks up where the last one left off, with Mary in the middle of the fight of her life. It's not easy being the newest wielder of the Witchblade, learning on the job, trying to keep the Darkness and the Angelus balanced. Luckily, Mary isn't alone in this struggle as the women who came before her have her back. One of the great things about Mary's development is her growing confidence as she receives guidance from those past bearers of the Witchblade that appear to her when needed. Una, the cavewoman, gives her unbelievable strength and Imani provides strategy and a sense of calm. We're seeing her blossom from awkward teen to awkward hero. She's accepting her new role while still learning what it all entails. Sejic is a master of bold designs with bright explosions of color. Some of the scenes are laid out perfectly using clever pacing and sequencing but really his signature facial expressions convey so much that words aren't always necessary. This is one of the benefits of reading a book written and illustrated by one person. There is a fluid and cohesive stream of storytelling that feels more engaged. 'Switch' #3 may have been late to print but it was worth waiting for. 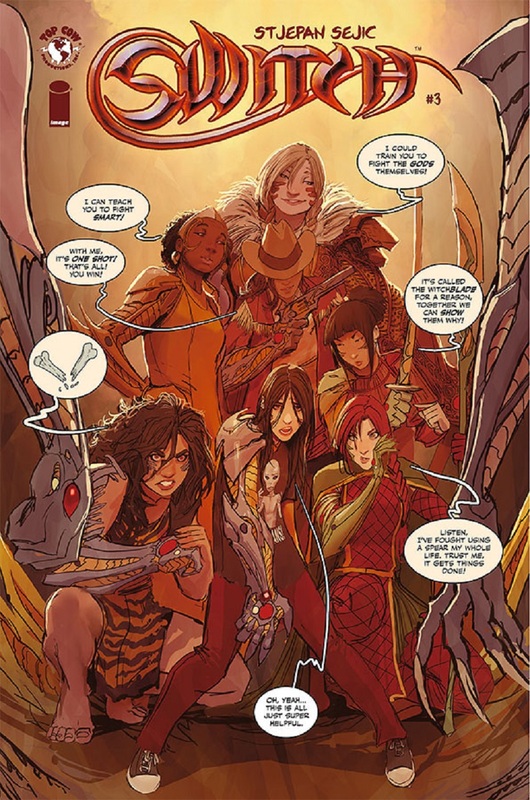 The rise of Mary as the new Witchblade continues to be endearing, funny, and most of all action-packed. The extended world building is growing organically with wonderful mentors for Mary. As fun an origin story as you'll find in comics. Now give me more!